Download "Introduction This Student Member Organizational Manual is designed to: 1. 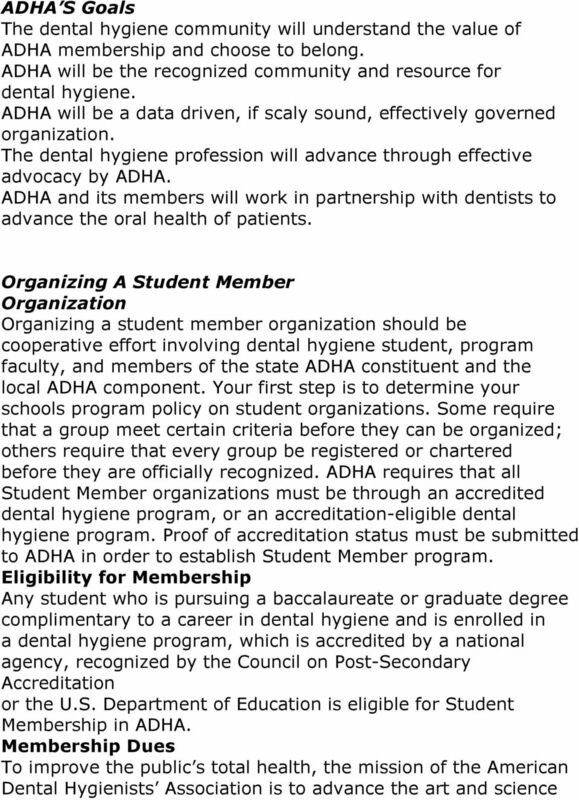 Assist dental hygiene programs that wish to develop a student member"
1 Introduction This Student Member Organizational Manual is designed to: 1. 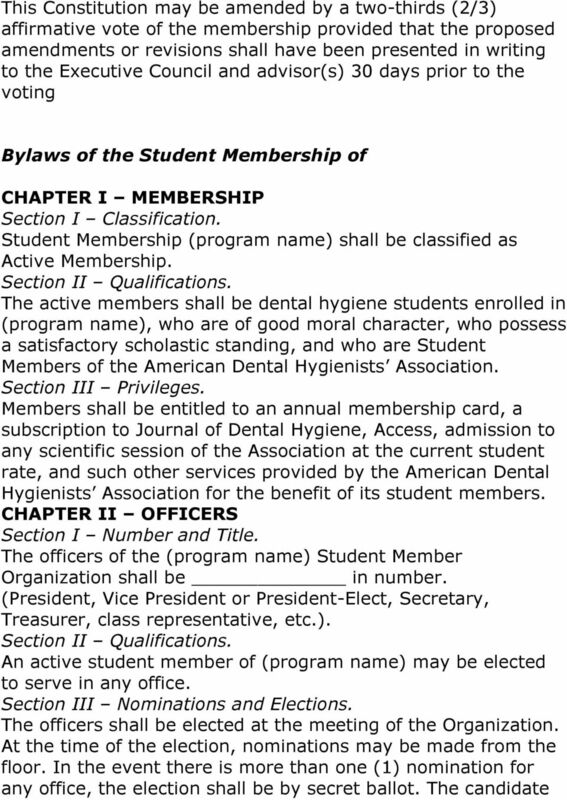 Assist dental hygiene programs that wish to develop a student member organization; 2. Provide assistance to student member organizations already in existence; 3. Acquaint the students with the ADHA structure and brand; 4. Offer a model for establishing student member organization policy. ADHA S Vision Creating a community for all dental hygienists and investing in their future. ADHA S Mission To improve the public s total health, the mission of the American Dental Hygienists Association is to advance the art and science of dental hygiene by ensuring access to quality oral health care, increasing awareness of the cost-effective benefits of prevention, promoting the highest standards of dental hygiene education, licensure, practice and research, and representing and promoting the interests of dental hygienists. 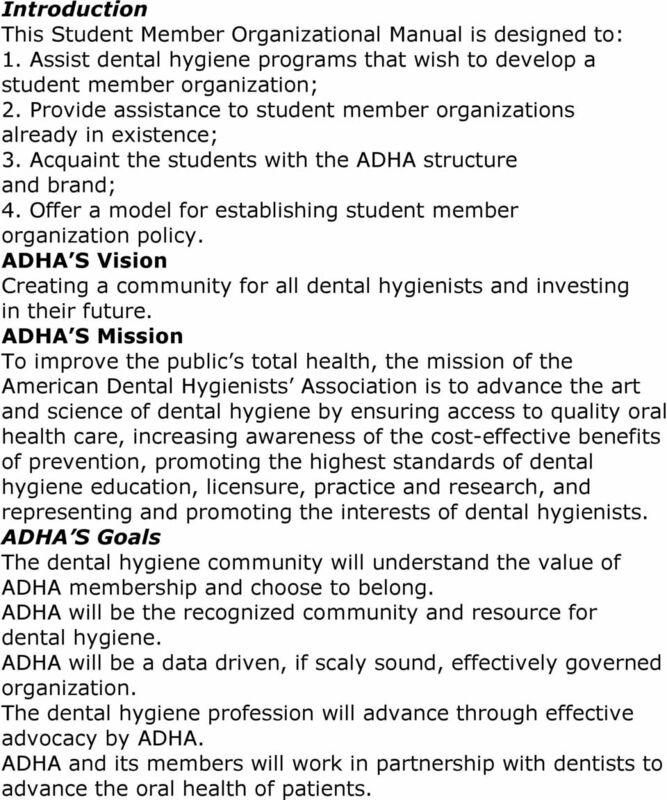 ADHA S Goals The dental hygiene community will understand the value of ADHA membership and choose to belong. ADHA will be the recognized community and resource for dental hygiene. ADHA will be a data driven, if scaly sound, effectively governed organization. The dental hygiene profession will advance through effective advocacy by ADHA. ADHA and its members will work in partnership with dentists to advance the oral health of patients. 4 treasurer; each elected for a one year term. Committees Committees will depend upon the specific goals and needs of each particular organization. The chair of the committee may either be appointed by the president or be selected from volunteers. Your committees may include the following: Membership Component (local dental hygiene society)/ Constituent (state dental hygienists association) Liaison Community Dental Health Program Development Legislation Special Projects: I.E., Fundraising, Continuing Education, Hospitality/Social, Table Clinics, Research Poster Sessions Welcoming/Orientation Faculty/Student Member Advisor Each organization should have an advisor who will be available to the student members for advice and counsel for all activities initiated by the organization. The Student Advisor MUST be a voting member of ADHA. 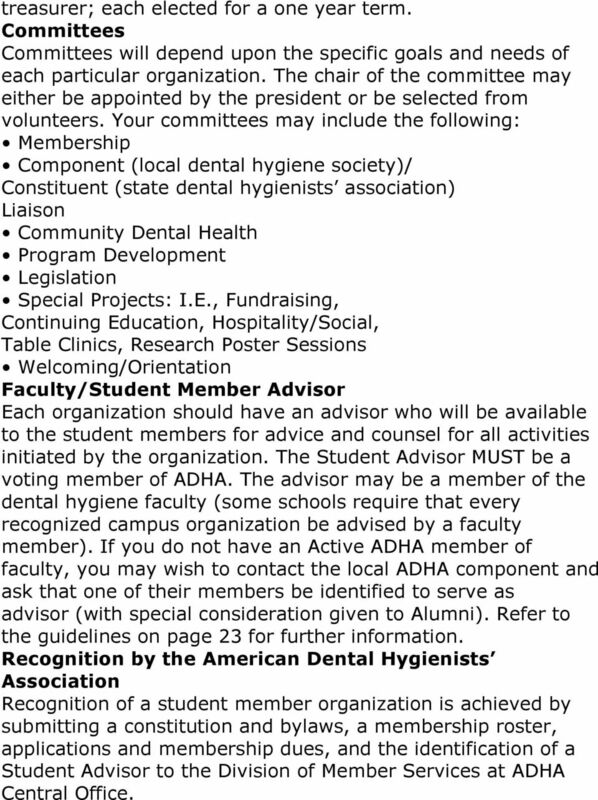 The advisor may be a member of the dental hygiene faculty (some schools require that every recognized campus organization be advised by a faculty member). If you do not have an Active ADHA member of faculty, you may wish to contact the local ADHA component and ask that one of their members be identified to serve as advisor (with special consideration given to Alumni). Refer to the guidelines on page 23 for further information. Recognition by the American Dental Hygienists Association Recognition of a student member organization is achieved by submitting a constitution and bylaws, a membership roster, applications and membership dues, and the identification of a Student Advisor to the Division of Member Services at ADHA Central Office. 7 receiving the majority of votes cast shall be declared elected. When there is only one candidate for an office, election may be by acclamation. Each member votes on all offices except the class representative, which shall be voted on only by members of the respective classes. 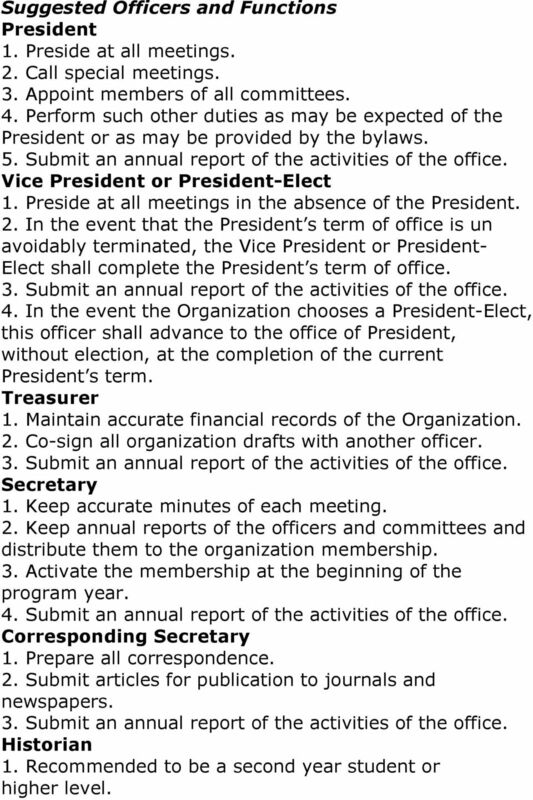 Adopted (date) Section IV Tenure of Office. The officers shall serve for a term of years(s). Officers will continue to perform their duties until they are re-elected for their successors have been installed. Section V Vacancies. In the event of a vacancy in one of the offices, the Executive Council and Student Advisor(s) shall consider all factors, which govern the situation and shall determine the course of action. Section VI Duties A. President. The duties of the President shall be: 1. To preside at all meetings. 2. To call special meetings. 3. To appoint members of all committees. 4. To perform such other duties as may be expected of the President or as may be provided in these bylaws. 5. To maintain communications with the American Dental Hygienists Association. 6. Prepare and present an annual report. B. Vice President (or President-Elect). 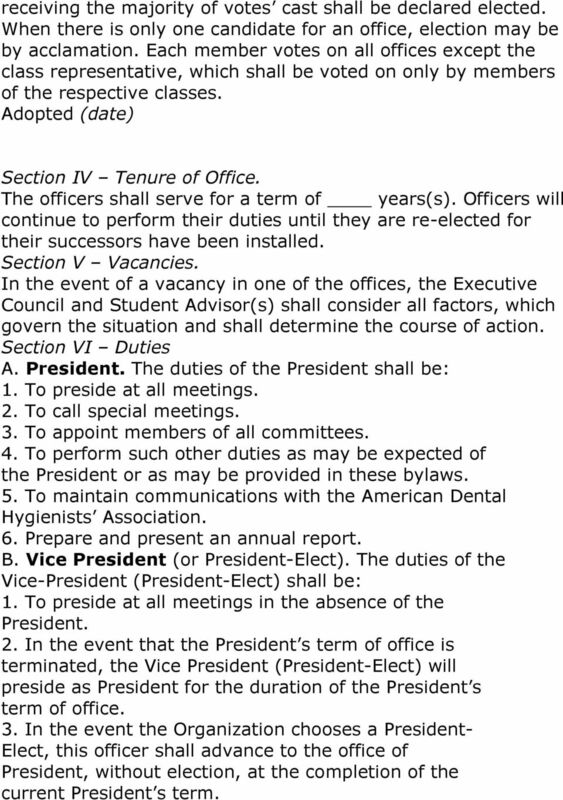 The duties of the Vice-President (President-Elect) shall be: 1. To preside at all meetings in the absence of the President. 2. In the event that the President s term of office is terminated, the Vice President (President-Elect) will preside as President for the duration of the President s term of office. 3. In the event the Organization chooses a President- Elect, this officer shall advance to the office of President, without election, at the completion of the current President s term. 10 Suggested Officers and Functions President 1. Preside at all meetings. 2. Call special meetings. 3. Appoint members of all committees. 4. Perform such other duties as may be expected of the President or as may be provided by the bylaws. 5. Submit an annual report of the activities of the office. Vice President or President-Elect 1. Preside at all meetings in the absence of the President. 2. In the event that the President s term of office is un avoidably terminated, the Vice President or President- Elect shall complete the President s term of office. 3. Submit an annual report of the activities of the office. 4. In the event the Organization chooses a President-Elect, this officer shall advance to the office of President, without election, at the completion of the current President s term. Treasurer 1. Maintain accurate financial records of the Organization. 2. Co-sign all organization drafts with another officer. 3. Submit an annual report of the activities of the office. Secretary 1. Keep accurate minutes of each meeting. 2. Keep annual reports of the officers and committees and distribute them to the organization membership. 3. Activate the membership at the beginning of the program year. 4. Submit an annual report of the activities of the office. Corresponding Secretary 1. Prepare all correspondence. 2. Submit articles for publication to journals and newspapers. 3. Submit an annual report of the activities of the office. Historian 1. Recommended to be a second year student or higher level. 11 2. Maintain an accurate scrapbook of all organization activities. 3. Submit an annual report of the activities of the office. Class Representative(s) 1. Represents their respective class at all meetings of the Executive Council. 2. Submit an annual report of the activities of the office. 3. Coordinate and facilitate communication from their respective class to the other members, classes, Executive Council or Advisor(s). 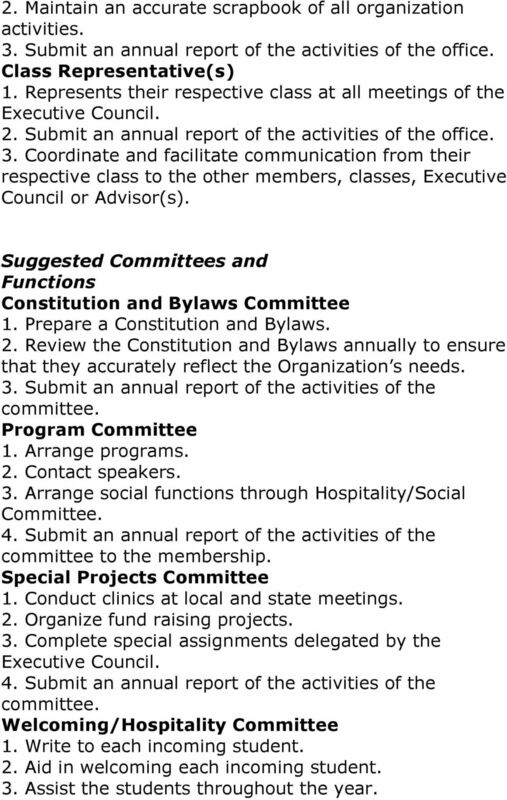 Suggested Committees and Functions Constitution and Bylaws Committee 1. Prepare a Constitution and Bylaws. 2. Review the Constitution and Bylaws annually to ensure that they accurately reflect the Organization s needs. 3. Submit an annual report of the activities of the committee. Program Committee 1. Arrange programs. 2. Contact speakers. 3. Arrange social functions through Hospitality/Social Committee. 4. Submit an annual report of the activities of the committee to the membership. Special Projects Committee 1. Conduct clinics at local and state meetings. 2. Organize fund raising projects. 3. Complete special assignments delegated by the Executive Council. 4. Submit an annual report of the activities of the committee. Welcoming/Hospitality Committee 1. Write to each incoming student. 2. Aid in welcoming each incoming student. 3. Assist the students throughout the year. 12 4. Assist in social/hospitality arrangements for special functions, i.e., homecoming, capping/pinning, and graduation. 5. Submit an annual report of the activities of the committee. Component/Constituent Liaison Committee 1. Develop communication with the ADHA component located nearest the dental hygiene program as well as the constituent. 2. Work with members of the local component to identify those projects or programs, which can be implemented as joint program activities. 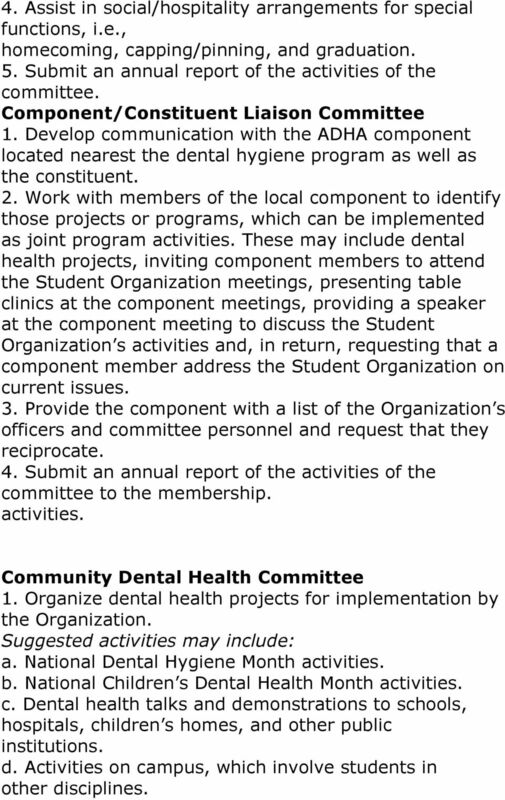 These may include dental health projects, inviting component members to attend the Student Organization meetings, presenting table clinics at the component meetings, providing a speaker at the component meeting to discuss the Student Organization s activities and, in return, requesting that a component member address the Student Organization on current issues. 3. Provide the component with a list of the Organization s officers and committee personnel and request that they reciprocate. 4. 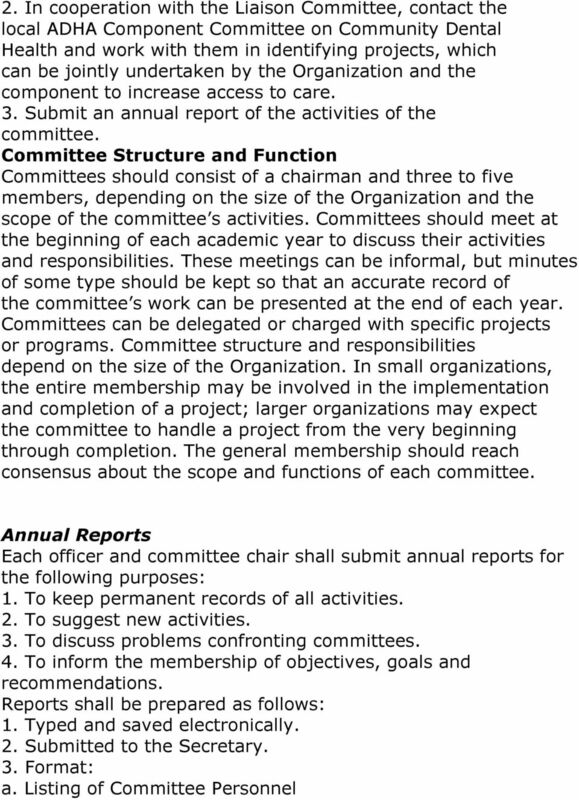 Submit an annual report of the activities of the committee to the membership. activities. Community Dental Health Committee 1. Organize dental health projects for implementation by the Organization. Suggested activities may include: a. National Dental Hygiene Month activities. b. National Children s Dental Health Month activities. c. Dental health talks and demonstrations to schools, hospitals, children s homes, and other public institutions. d. Activities on campus, which involve students in other disciplines. 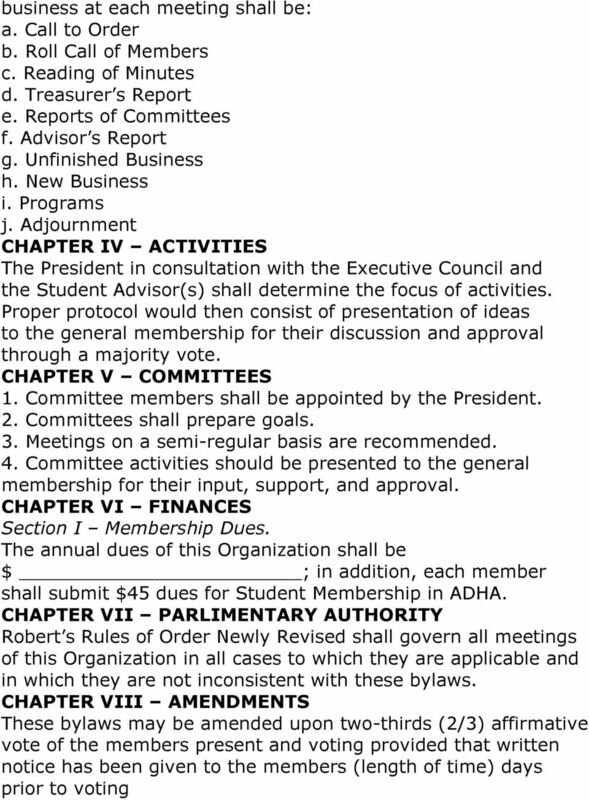 CONSTITUTION OF THE COUNCIL OF GRADUATE STUDENTS California State University, Chico Chico, California 95929 Article I. Name Section 1. The name of this organization shall be the Council Of Graduate Students. Constitution Revision: February 2011. NRHH The National Residence Hall Honorary Nittany Chapter, Penn State University. Founded: April 1984 I.
Tri-M Music Honor Society Chapter (number) at Poland Central School District. MINNESOTA STATE UNIVERSITY, MANKATO SCHOOL OF NURSING BYLAWS ARTICLE I. NAME, GENERAL POWERS, PURPOSES The name of this organization shall be the Minnesota State University, Mankato School of Nursing. 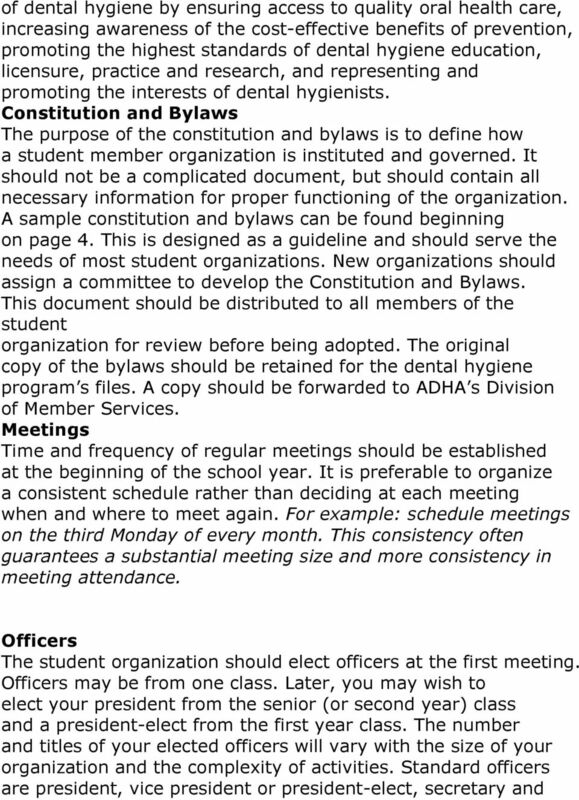 RULES OF PROCEDURE for the American Association of Colleges of Pharmacy House of Delegates Approved by the 2014 AACP House of Delegates Table of Contents 1. Authority and Process to Adopt or Suspend Rules..